USB ports have become a one-stop solution when it comes to topping up your vital electronic gadgets and accessing the data stored there from a computer or laptop. Still, going can get a bit tough if you have multiple USB-compatible devices in need of some tender, juice and PC connection and you’re out of free ports. That’s why Satechi, the world-famous San Diego-based tech manufacturer came up with the innovative 10 Port USB 3.0 Premium Aluminum Hub which enables you to charge up to ten devices at the same time. Let’s take a closer look at this cool gizmo, shall we? 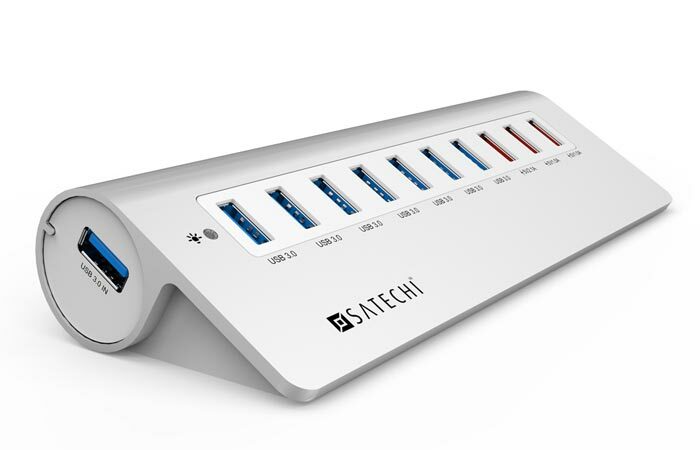 As a follow-up to their 4 Port and 7 Port USB 3.0 hubs released a while earlier, Satechi 10 Port USB Hub boasts an impressive score of ten ports (seven SuperSpeed USB 3.0 and three charging ports) and data rate of incredible 5.0Gbps, allowing you to connect a host of mobile tech like tablets, smartphones, flash drives, digital cameras, external hard drives and even printers to your PC. One of the three charging ports found atop of the hub is a 5V2.1A port for juicing up tablets, while the other two ports are the regular 5V1.0A outlets compatible with smartphones and a range of other mobile devices. In addition to the super-quick data transfer through USB 3.0 connection (forward), the latest Satechi hub is also compatible with USB 2.0 and 1.1 devices (backwards) so you’re all covered whatever your source and target devices may be. Sleek and elegant, Satechi 10 Port USB Hub sports a premium aluminum strip-shaped design with brushed aluminum finish which makes it highly resemblant of much-loved Apple gadgets, so this little trendy gadget will prove an ideal companion for your iMac, MacBook, Mac mini, Mac Pro, MacBook Air and MacBook Pro. 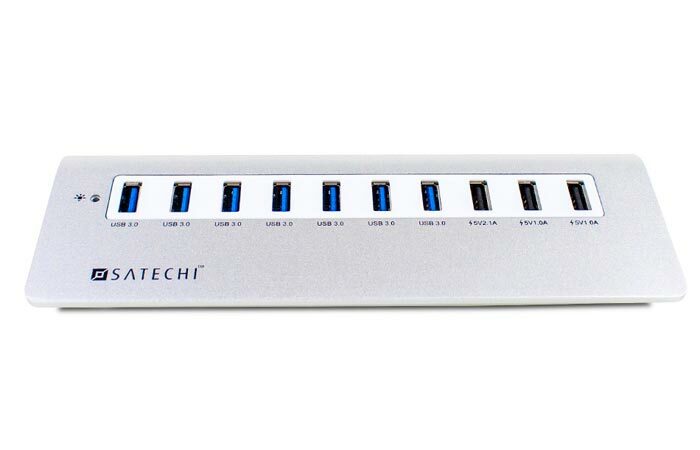 Equipped with a secure energy supply via the included wall adapter, Satechi 10 Port USB Hub will deliver reliable performance and stable electricity current for trustworthy operation 24/7 and easy access to the data stored on a wide range of USB-compatible devices. 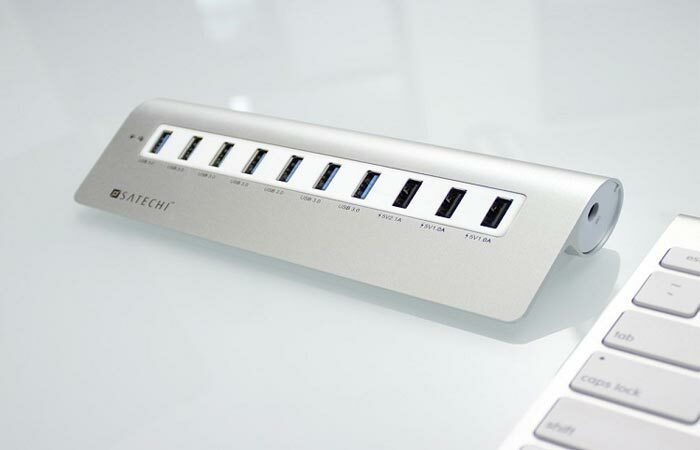 Built to be super-simple, versatile and extremely functional, Satechi 10 Port USB 3.0 Premium Aluminum Hub functions by plug-and-play so you won’t have to fumble with any additional drivers, extra software packages or complicated installation procedures. 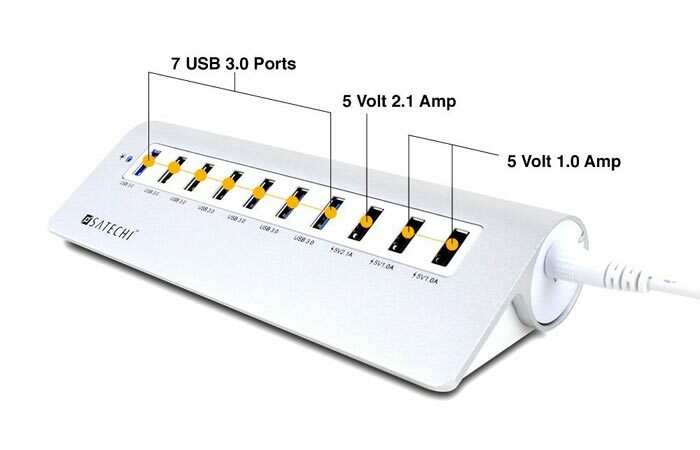 The Satechi 10 Port USB Hub will work well with Windows (supported versions include Windows 8, 7, Vista, XP, 2003, 2000 and ME), Linux (kernels 3.0 and above) and Mac OS X (with latest software updates from Apple). Measuring 7 x 2.5 x 5.75 inches, the Satechi USB Hub is a perfect gift for zany tech lovers who’re always short on juice in at least one of their mobile devices so make sure you check it out ASAP. Who knows, perhaps this cool gadget is one of the presents you will definitely want Santa to stuff down your Christmas stocking this year.